Did you know that the leaves of the drumstick tree are edible and are loaded with nutrients? 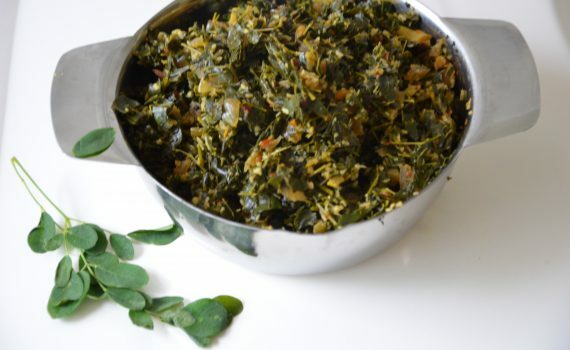 Drumstick leaves are a common green leafy vegetable in most Indian homes especially down South. It is known as Murungai in Tamil, Nuggekai soppu in Kannada, Muringa in Malayalam. Long known for it’s medicinal and nutritional properties in Ayurveda, it has of late been in the news in the West and is heralded as a miracle tree. Researches believe that the leaves can help in lowering blood sugars among diabetics, reducing cholesterol and also help in reducing inflammations, joint pain, constipation and cancers among others. Drumstick leaves are rich in calcium, potassium, Vitamin A &C and fiber. Drumstick leaves are sold in health stores in the form of powders and capsules. I however love it as a stir-fry and make it whenever I find the leaves in the Indian store. Chop the washed leaves as fine as possible. Finely chop the onions and slit the green chilies. Heat a kadai, add the oil, then the mustard, cumin seeds and urad dal. When the mustard seeds start to pop, add the slit green chilies, turmeric powder (optional)then the chopped onions. Fry till the onions turn translucent. Then add the drumstick leaves and stir for a couple of minutes. Add some salt and mix well. Then add some water and let the leaves cook, stirring occasionally. Once the leaves are cooked, add the grated coconut, mix well and switch off. Since it’s a dry sabzi, it goes better with rice and a curry.